Paul George outgunned James Harden in a match-up of MVP candidates as the Oklahoma City Thunder erased a 26-point deficit to escape with a 117-112 win at the Houston Rockets on Saturday. Westbrook matched an NBA record set by Wilt Chamberlain with his ninth consecutive triple-double: 21 points, 12 rebounds, and 11 assists. Highlights of the Oklahoma City Thunder's clash with the Houston Rockets in Week 17 of the NBA. Harden, meanwhile, totalled 42 points - his 29th consecutive game with at least 30 - but he missed a contested three-pointer after Westbrook pushed the Thunder ahead. The Thunder matched the Rockets' 42-point second quarter with a 42-point third period, keyed by 7-for-12 three-point shooting and after committing just two turnovers in the first half, the Rockets had six in the third quarter and collapsed with 1-for-9 shooting from behind the arc. 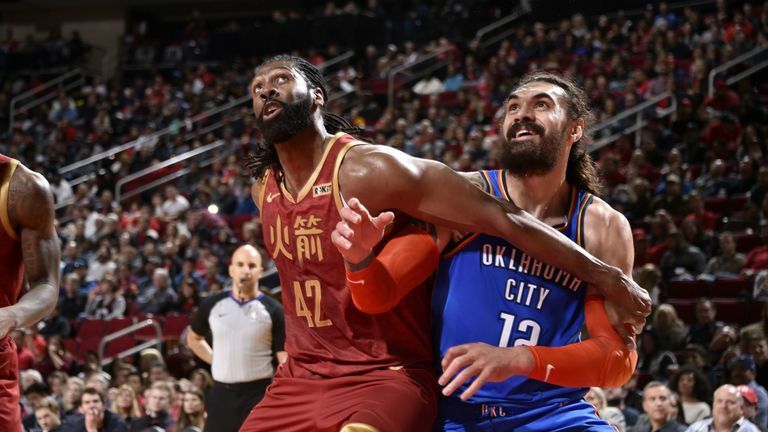 Still, the Rockets led 86-79 before Thunder guard Dennis Schroder closed the frame with 11 consecutive points to pull Oklahoma City even at 90-90 entering the fourth. Less than three minutes into the final frame, the Thunder led 98-92, and the Rockets were left scrambling. Houston had earlier pushed their lead to 58-42 despite a mini-surge from Westbrook before landing what appeared to be a devastating blow: a 10-0 run that included three-pointers from Paul and Harden plus three Harden free throws. But the Rockets were 12 of 24 from deep late in the first half, before missing five consecutive three-pointers to leave the door ajar for a comeback.